The Le Sigh: Premiere: GLAND - "The Velvet Glove of Self Love"
Premiere: GLAND - "The Velvet Glove of Self Love"
GLAND is back and as radical as ever. 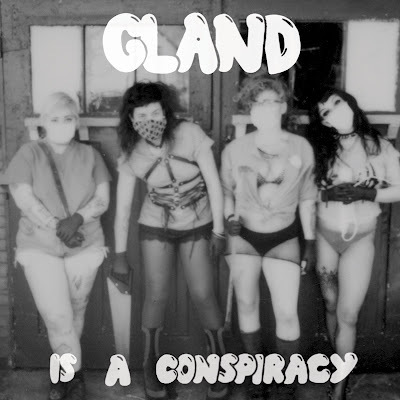 GLAND has always been loud and clear about their politics, flashing a Black Lives Matter poster in their last music video which also depicted them shooting effigies of George Zimmerman. The first single off their new EP, Is a Conspiracy, tackles self-love, another important political act. “I’ve never felt something so good against my skin,” wails vocalist Kallie Van Tassel on the album’s opening track, “The Velvet Glove of Self Love.” These titillating, suggestive lines are punctuated by pingy, catchy riffs between doom-y verses. It’s melodic but distorted, with drums beating at a steady, take-your-time pace. Reminiscent of Bricks are Heavy-era L7, the punk outfit from New Orleans reminds us that you don’t always have to rush to make your point. “The Velvet Glove of Self-Love” is the first of four songs on the new EP, which relies heavily on themes of defiance - like choosing a life path different from what is expected of you, and fighting your ex, for example. GLAND has consistently dished out flawless punk anthems, and on Is a Conspiracy they continue to deliver. The 7” will be released on June 2 through Community Records and you can pre-order it here. "The diamond one. The reptile haus. Pieces to a puzzle, or red herons along the way? Who's to say... until you play. Await further instruction." Listen to GLAND on soundcloud.